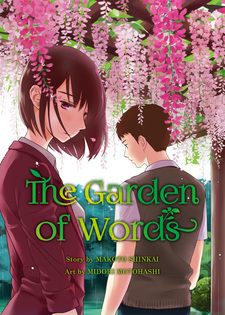 Kotonoha no Niwa was published in English as The Garden of Words by Vertical Inc. under the Vertical Comics imprint on October 28, 2014. This is my first time reviewing a series with a full 10/10 in every aspect. Story: The story is the same as the movie it is based off on. Extra moments were added to develop Takao and Yukino's relationship more, and the ending as well was not in the movie - it gave an overall, hopeful and positive feeling. Art: The art was very pleasing to the eyes. I love seeing the blushes on our protagonists' faces, and their gentle gestures. The tone the movie displayed was very apparent in this manga adaption. I love the way the postures were drawn, and the drips of water on the leaves were beautiful as well. Character: The characters and their worries were significantly what made this series so memorable. I love that although Takao and Yukino clearly have their differences, they have their own worries that they need to overcome. It's so wonderful that the two helped each other move forward in life. It really does show you that people can have struggles at any age, adults included. Enjoyment: This manga was very enjoyable. It felt nice to relive the series by flipping the pages and seeing what has both stayed the same and what has been added from the movie. It was very nice to see Motohashi's care and effort placed in this manga version. Overall: It was a very pleasant experience to read The Garden of Words. The theme and poetry of the series gave me a fulfilling feeling, as well as reflective. Ah, love... What would it be of our lifes without love? It moves the world, it makes us feel things, it makes us happy or destroy our heart... A strong feeling, motivation of hundred of people every day to fullfil their routine. You can love a person, an animal, the music you listen, anime and manga... I hope you agree in it, because Kotonoha no Niwa brings us some cups of sweet sweet love. This manga is an adaptation of the well known movie made by Makoto Shinkai (the best he's made in my opinion) in 2013. In it, it tells the exact same story as the movie, but with some little differences, details that make Takao and Yukari more human. 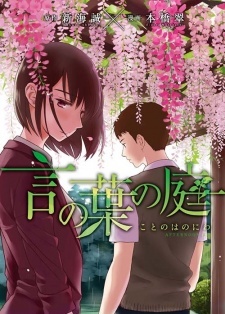 For those who may not know about it (if you are here, I suppose you saw the movie and want more), Kotonoha no Niwa —or The Garden of Words— tells the story of Yukari Yukino, a 27yo woman, and Takao Akizuki, a 15yo student. Takao has decided that the rainy days, he'll not assist to the high school, because he would be drawing shoes in a park. His dream is to be a shoemaker. One day he encounters a mysterious woman drinking beer and eating chocolate in the same spot he always visit to be alone. The woman, out of nowhere, tells Takao a 'Tanka', a japanese poem. From that day, Takao and Yukari meet each other every day thar rains. The story is pretty simple, but it's beautifully related as an impossible romance. One of Shinkai's main themes in his movies is the distance between two individuals and how they know each other. In Kotonoha no Niwa, we see how they begin to love each other. This tries so hard to tell us that it doesn't matter who you are, because if you support me, I'll support you. Kotonoha no Niwa is, somehow, a bittersweet romance, impossible to complete by now. Different ages, different positions, but the same strong feeling of human need. The ending is really satisfying. The movie showed us how Takao tried to convice Yukari (and himself) that he was only a tool, that he mattered none to her. In the other hand, in the manga, we are blessed with a mature but childish monologue that comes to say the exact same thing but different. Takao wants to know why if she had been treating him like his equal, now, in that exact moment (when he confesses to her), she starts acting like an 'adult'. The art is incredibily good. It has some accurate details in the backgrounds and the faces are so well drawn, maybe better than the movie itself. The dialogues were sometimes messy, difficult to follow —because it uses a bubble system that misleaded me. The character creation is the same that in the movie but with some improvements. We are delighted with some Yukari moments that build her personality. I could, in every moment, believe what I was reading. They treated each other like strangers, but like if they had known for all life. The intimate moments in the garden are perfect, and even if the magic scene when Takao draws Yukari's foot is the same as the movie, it felt even more intimate. I love Kotonoha no Niwa, I can't deny it. It pierced my chest like an arrow, and I really hope that this manga adaptation is not the last thing we see about that impossible couple. If you liked the movie, I strongly suggest you to read this, because is the same but has more things to offer. My review on this is; it's pretty good. As far as the art goes, it's pretty. I'll give it that, however I'm not a fan of how more than half of the time no-one has a face. It's just an empty void. Not sure if it's just the artist's art style, or if it was just rushed. I still enjoyed the artwork. The story is pretty good, short.. I was sort of disappointed by the ending, and I don't know if it was just me but I was not expecting the main character being that young. Maybe I missed where they had mentioned how young he was at the beginning, but I got the impression that he was 16+. Good short read. Is it worth $13? No. Is it worth $6-7? Sure.